We offer a range of carpal tunnel treatments to patients in the Greenville, Spartanburg & Anderson areas. Do you feel numbness or tingling in your hand at night? 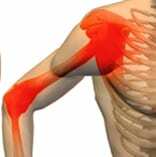 Do you sometimes experience a sharp pain that goes up your arm to your shoulder? Do you have trouble holding objects without dropping them? You may be experiencing symptoms of carpal tunnel syndrome. Carpal tunnel syndrome is a common problem that interferes with the use of your hands. It most often occurs when tendons in the wrist are inflamed after being aggravated by repetitive movements such as typing on a computer keyboard. This may cause progressive narrowing of the carpal wrist tunnel of bone and ligament that passes through the center of the wrist. The result is pressure on the nerves to the fingers and to the muscles at the base of the thumb. Carpal Tunnel Syndrome occurs when the median nerve is squeezed at the wrist. There are a number of causes associated with carpal tunnel syndrome. 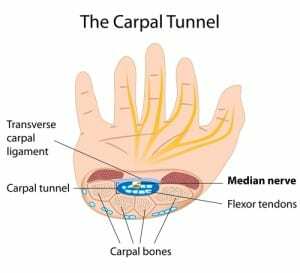 Any repetitive motions that cause significant swelling, thickening or irritation of the synovial membranes around the tendons in the carpal tunnel of the hand can result in pressure on the median nerve. This nerve conducts sensations from the hand up to the arm and to the central nervous system. Some other causes include: repetitive and forceful grasping with the hands, consistent bending of the wrist, broken or dislocated bones in the wrist, arthritis, thyroid gland imbalance, diabetes and hormonal changes associated with pregnancy. However, in some cases, no cause is found. The first place to start is with your doctor. Oftentimes a suspicion of the problem can be ascertained with a simple office visit. In order to provide a definitive diagnosis, however, a referral to a specialist who performs a test called Electromyography (EMG) and Nerve Conduction Studies (NCV) is required. These tests are relatively harmless, and involve the use of small electric shocks as well as pins. It is very important to have a proper diagnosis, as other conditions such as pinched or irritated nerves in the neck, or strained ligaments in the wrist, elbow or spine can mimic Carpal Tunnel. Initial non-invasive treatment for carpal tunnel syndrome includes rest or use of a wrist splint during sleep. Hand therapy, steroid injections, modification of the perpetrating source and disease management techniques can also be effective. If patients experience severe pain that cannot be treated through rehabilitation or other non-surgical techniques, then a relatively simple operative procedure called carpal tunnel release should be considered. The carpal tunnel is comprised of bones, tendons and ligaments that surround the median nerve, which travels to the arm, wrist, hand and fingers. The goal of this surgery is to relieve pressure placed on the median nerve in the carpal tunnel. 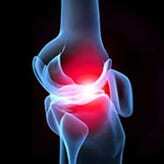 The results are usually very good, with most patients receiving nearly full relief of their symptoms. It’s important that if you do notice symptoms, do not wait for them to become intolerable. The earlier you get a diagnosis and treatment, the better the outcome. Fortunately, the majority of cases do improve with non-surgical management, and if surgery is required, reoccurrence only occurs in a small percentage of patients. At Piedmont Physical Medicine & Rehabilitation, we work closely with you in order to help assure a favorable outcome irrespective of which method of treatment is required.